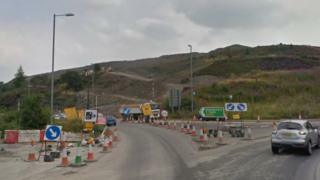 A review has been ordered into Wales' largest current road building scheme, amid concerns it is running over budget and is behind schedule. Economy Secretary Ken Skates wants a "comprehensive" look at the £220m project to dual the eastern section of the A465 Heads of the Valleys road. It was due to be completed by the spring of 2019. But BBC Wales understands that it is now likely to be delayed - with significant cost implications. Dualling of the four mile (6km) stretch between Gilwern and Brynmawr in Monmouthshire and Blaenau Gwent started in early 2015. A Welsh Government official said: "The challenging nature of the scheme has meant that the programme for completion has been impacted and in light of this the cabinet secretary has ordered a comprehensive programme and cost review of the project to be undertaken. "This process is expected to be completed shortly." Welsh Conservative leader Andrew RT Davies, a regional AM for south Wales central, called on the Welsh government to make a formal statement. He said many of his constituents were employed by firms who "feared for their futures". Businessman Gareth Thomas fears his Brynmawr-based waste management firm, which employs 68 people, may not last the next six months. He says the situation is "impossible" and that he has received "zero support" from the Welsh Government. Mr Thomas said lorries now take up to three hours to take skips to Abergavenny, when the journey took an hour before the roadworks, meaning he has had to take on more staff. The work is part of the Welsh Government's £800m upgrade programme for the road, turning the whole route from Monmouthshire to Neath Port Talbot into dual carriageways by 2020.